All amenities and surroundings are in good order with high under cover parking. Nice aspect over the plains and garden. Comfy interior with good size rooms. Very private quiet and secure. Great place to base yourself to explore area with local knowledge from Alan. Highly recommended. It was a great experience staying in Back Forest Retreat. Thank you for organising everything in the cozy cottage. We all loved Waffle and Cocoa and of course the Hens. 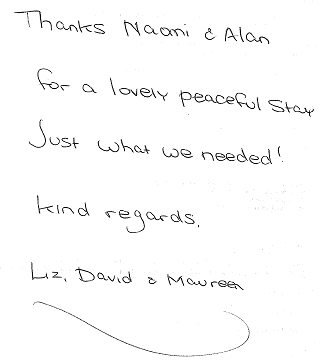 Thank-you Alan & Naomi for a relaxing,albeit too brief, stay. We look forward to returning to Back Forest Retreat some lucky day in the near future. 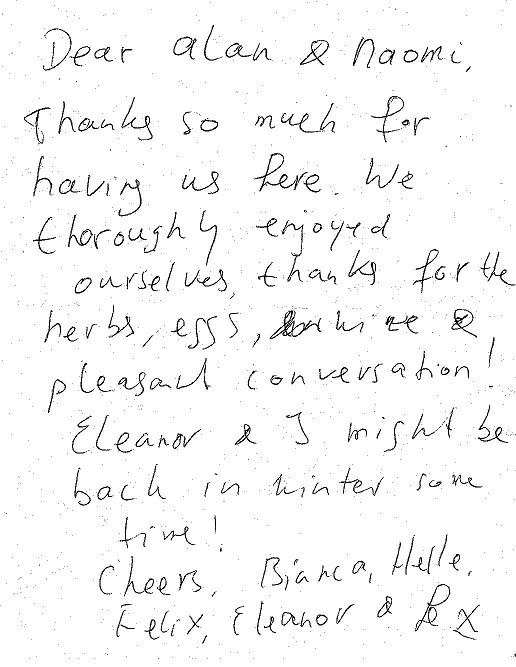 We did have a wonderfully restful time in your cottage thank you. We found it enormously comfortable and such a lovely, peaceful location and there is no feedback we could give you about things to change as everything was already as it should be. 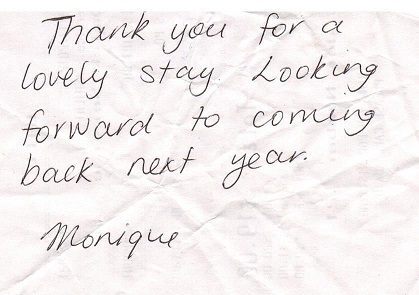 We will definitely be back again and will contact you directly when we get the dates sorted. 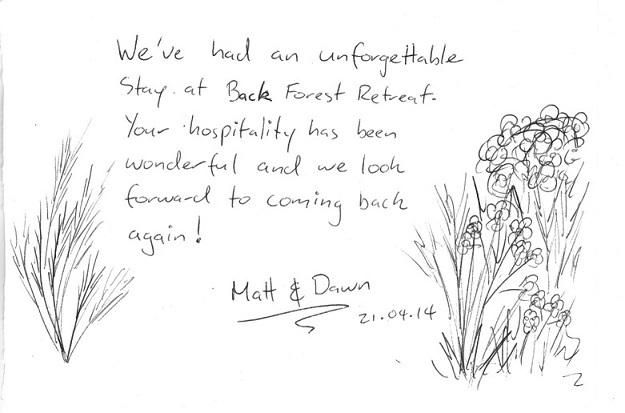 Just a quick note to thank you for our stay at Back Forest Retreat. We had a great time and enjoyed the cottages, the beautiful setting and your kind hospitality. Especially the cucumbers and tomatoes! I trust all is in order following our departure earlier today. 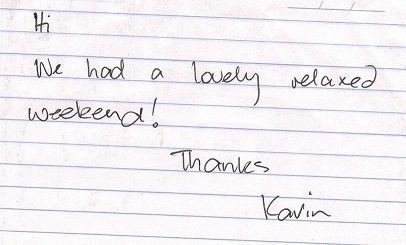 Thanks once again and we certainly hope to have a return visit sometime soon. 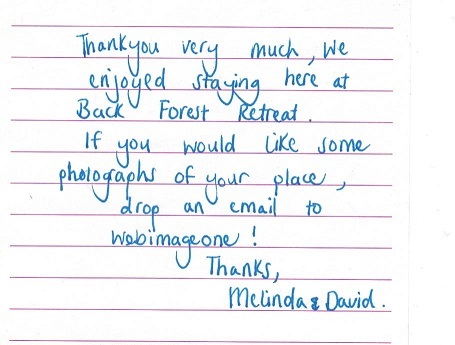 I just thought I would drop you a short note to again thank you for all you did for us on our recent stay at Back Forest. You went out of you way to make us feel very welcome and this was most appreciated. The kids had a wonderful time and especially loved waffles and the other sheep. 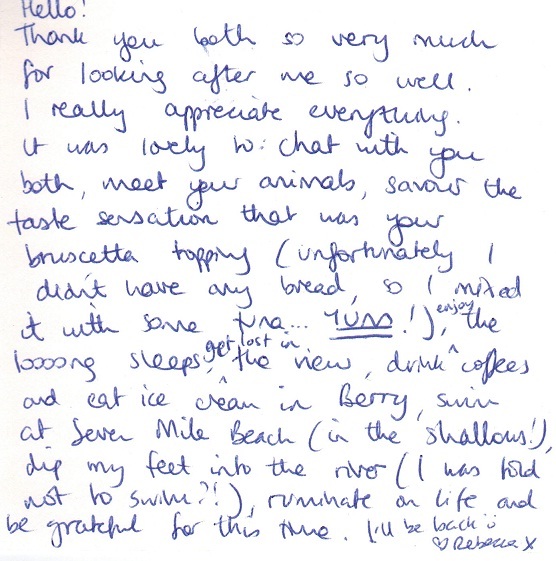 It was great having the extra beds and everyone had a very enjoyable relaxing holiday ..
"That bed is so comfortable, I slept so well"
"This is a good size house, I wish I have a house like this"
"Wow they have prepared everything!" "I will bring my mum here next time she comes from overseas"
"Oh now I want to have a ping pong table too"
"This is my first time to see Milky Way!" "...I like the smell of the hand wash..." I feel very relieved that you think the house is clean enough :P. We appreciate the fact that you offered us a discount based on that condition so wanted to do our best to repay your trust :). By the way, we went to the bakery twice in two days. Thank you for the recommendation. None of us had been there before but after this trip we were all saying we will come back one day. At last, thank you for offering the discount when we return. Hopefully we will be back soon! Thanks for your correspondence, it was timely and thorough. Everything was ready when we arrived so thanks for the early access. We had a lovely stay at the cottage couldn't have asked for a better place and outlook. It was spectacular and a lovely introduction to Nowra. I took lots of lovely photos and will be telling everyone how great the cottages are. I could have quite comfortably lived there for ever. Very tranquil and therapeutic, it definitely helped keep us calm and grounded. We enjoyed looking after the chooks and talking to the goat and sheep and of course the lovely fresh eggs went down well. We had an amazing stay at Black Forest Retreat. 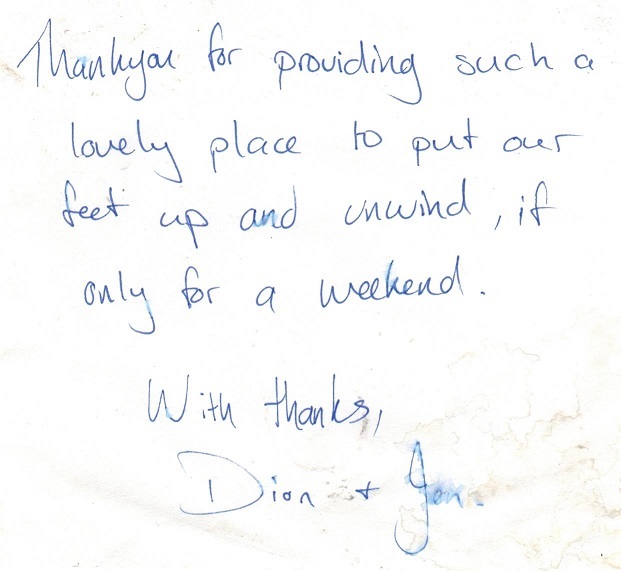 The cottage was comfortable, clean and well maintained and we had a very relaxing stay there. We would definitely be staying there again the next time we decide to take a trip down the south coast. Thanks again for your wonderful hospitality. Thank you very much for your hospitality and helping us make our stay a memorable one. We all enjoyed the stay there, the cottage, the location, scenery and weather..all were great. And we’ll be definitely recommending this place to our friends travelling to south coast. It was our great pleasure! We enjoyed the cleanliness, and the layout of the cottage. We were able to sleep peacefully, with no traffic noise. Waffles was a hit! We used both bedrooms-the double bed and also the lower bunk-bed. Thank you for the offer of a discount next time. We will be back again. Yes, we had a very comfortable stay in the cottage – it is certainly well-equipped with all one would need for self catering and I will certainly recommend it to anyone looking for accommodation in the region. The Shoalhaven River flats are a really beautiful location for rest and recreation. Sorry we did not bid you farewell, but we thought you may still be asleep. We wanted to make good progress before the heat built up too much by the time we got to the Hunter Valley. Your region really excelled itself with the beautiful day on Sunday for the wedding, and cooling rain for travelling yesterday. It must have been a frightful weekend here, as there is so much heat damage in the garden. We all really enjoyed staying in the cottage. The garden and setting was beautiful, the cottage design unique and awesome & we loved the ping pong table. We had boiled eggs one morning and didn't have enough tea spoons so that would be my only suggestion! Good luck for you business in the future, it is an off the beaten track treat! Have a wonderful 2014 and hopefully we’ll be back one day! Just wanted to let you know that we thoroughly enjoyed our stay over Christmas at the cottage. The layout of the cottage worked really well for Malcolm's wheelchair and the ramp at the front door was a fantastic bonus. We had some friends who live in the area call by on Friday and they were mighty impressed with the cottage and it's situation. Thanks again and looking forward to book in again next year. 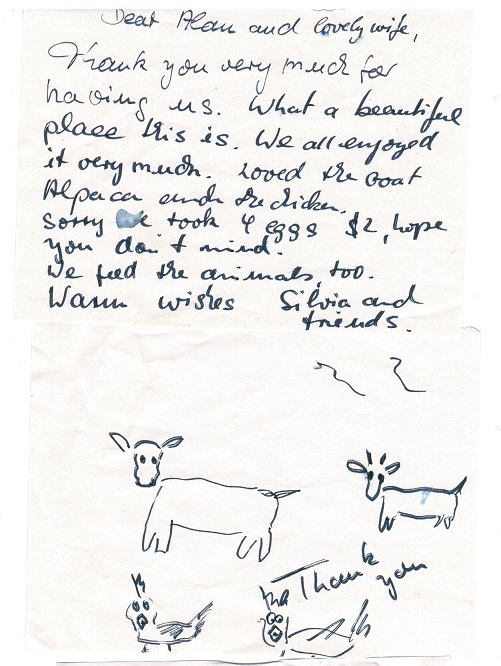 Loved the goat and it loved us but the sheep were shy. Really liked the cottage garden with the butterfly bush and roses...and the pond. Thanks for the coffee and milk too! We loved the set up and everything was great. Very spacious and tidy. We feel rested and refreshed after our time away. We came up and knocked this morning because we wanted to let you know just how much we'd enjoyed staying with you but imagine you were out. We loved the cottage and were really impressed how cool it kept inside. We were very comfortable and yes, it was incredibly restful, we just wish we'd stayed longer. Loved the outlook and all the birds and your beautiful flowers. Yes, we managed to do a couple of things as part of the Lloyd Rees Festival and that was excellent. There's a very nice exhibition that will be on for a while at the Shoalhaven gallery at Nowra which I would recommend. We also enjoyed a great meal at The Wharf at Nowra, the Berry markets and swam and shopped (a bit too much). You live in a lovely part of the world. I was wondering if you had any availability at Christmas, in particular say 3/4 nights arriving Christmas Day and departing 28/29 December. I imagine we've left it too late but thought it was worth asking.